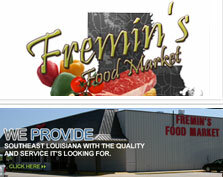 Fremin's Food Market prides itself in providing full lines of grocery, produce, dairy, frozen food and meat. We offer an on-site delivery service to all our customers and only deliver the freshest food available. Stop by or order online today to get the savings you deserve. We provide quality products delivered in a timely fashion. Our team is dedicated to customer satisfaction. We specialize in servicing large and small independent grocers and food distributors with quality Beef, Pork, Poultry and Seafood. For more than 50 years, Thompson Packers, Inc. has proudly catered to the food service industry. Hotels, restaurants, other institutions and distributors have continuously turned to Thompson for their "center-of-the-plate" meat products. Provide an all natural, high quality locally raised beef product that you and your family will consistently enjoy on your plate and in your budget. We are committed to our beef from our pasture to your plate. Locally raised No Antibiotics No Growth Hormones Please visit our Beef Products page for more information. We're proud to have been providing quality products and customer based services in Baton Rouge since 1996. Visit our store and experience the friendliness and helpfulness of our employees and you'll be certain to visit again. slidesOur mission is to provide our customers with the very best. We always stock the highest quality produce, meats, deli items, fruits, seasonal items, liquor and standard food items that are available in the Baton Rouge area.